February 2nd 1998 Qualification for Sports Proxy for F.I.G.C. 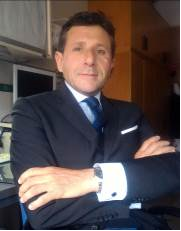 Since academic year 1996 till 2001, Andrea Cammarano has been doing tutoring activity for the Forensic Medicine and Insurances Professorship at Medicine and Surgery Faculty of “Tor Vergata” university of Rome. He has been interested the legal, administrative, doctrinal and scientific aspects of the subject. At the beginning of this activity, he used to word under the guidance of Prof. Piero Fucci. Afterwards he worked in the same sector for Prof. Giusto Virgilio Giusti and Prof. Giovanni Arcudi. Older of a chair for the course “Public and private law elements” for the “Forensic Odontostomatologics” post-degree specialization class directed by Prof. Giovanni Arcudi . Teacher for “Forensic sciences” research Doctorate, Forensic Medicine and Insurances Professorship, Medicine and Surgey Faculty, “Tor Vergata” University of Rome, “Elements of legislation” class.